Why you need a water heater replacement in Chandler, AZ? Why you need a water heater replacement? Water heaters, like most equipment, have a shelf life. When they have been around for a long time, they start acting up. Though a lot of people tend to wait till their heaters fail them before they act, you do not have to do the same. You could get yours replaced before it gives up on you. There are various ways by which you can know if you need a water heater replacement in Chandler, AZ. One is when your start seeing signs of rust or sediments in your water. Another is when your water changes color and has a metallic smell and taste to it. It might mean that your water is reacting with the heater and your water has overstayed its use. Then you certainly need to act fast and call a professional. Having a water heater can make bathing very pleasurable but when you turn on the faucet and get hit by an icy spray, then there is a problem. A leak is a bad omen. 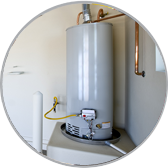 When water starts leaking from your water heater, or it starts building up around it, then you most probably need a water heater replacement in Chandler, AZ. You do not want the water to mess up the room where the unit is placed. Little drops of water they say make a mighty ocean. That trickle of water you think is not a problem can quickly escalate and flood your house, leading to other problems entirely. Yet another pointer that your water heater needs replacement is when it starts making loud pops or grating sounds, or if it constantly develops faults and needs continuous repairs. Again, if you do not know or can't remember when your current water heater was fixed, then you need to change it. Don't wait till it is too late. Get help immediately! Get it replaced!